Hello everyone. It is now winter in my part of the country.We had a couple inches of snow the other day. Thank you for the comment Rebecca. I was at Chutes Provincial Park in Massey Ontario for the first time with a couple photogrphy friends,John Kurczak and Paul Smith exploring the Chutes and Severn Sisters Falls this fall. When I am out photographing, I am always on the lookout for a composition that is a little different than normal. The above photo fits that scenario. 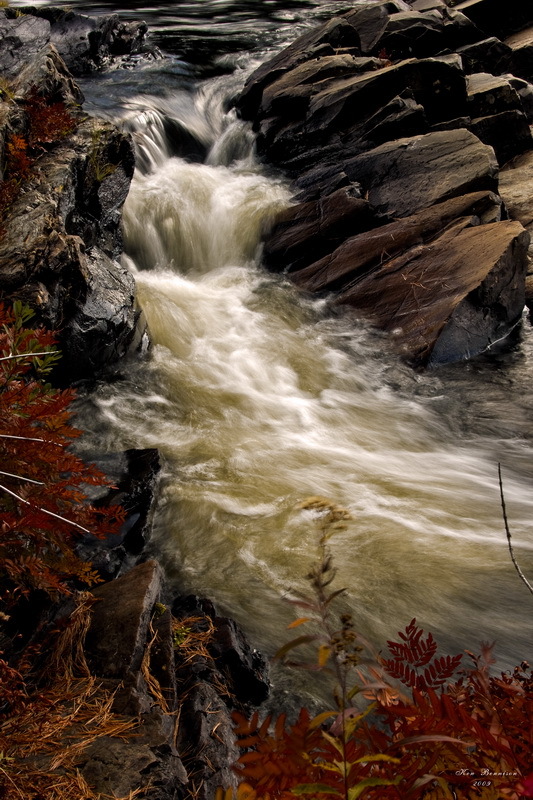 By framing the rushing water with the reddish brown ferns at the bottom and left side,your eye is led into the photo. On the right are unique chocolate rocks that have uniform shapes to add to framing the water.This shot was taken on a cloudy day at 10:00 AM in the morning. I had to wait till the sun went behind clouds to even out the lighting and not blow out the highlights in the water.I shot this photo on tripod at 35mm set to 1/4 sec. @ f22.